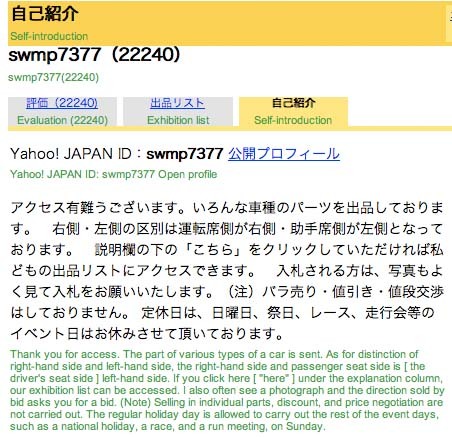 Yahoo Japan Auctions are a great place to find your dream items with honest sellers. Rinkya will guide you with our easy tutorial on safe bidding. The Rinkya checklist is a tool to use before bidding on items - especially high-priced ones. First, you need to know how to access the listing information. After that, we tell you how to use that information to make sound bidding judgments. The following points are researched suggestions to help you make better decisions when bidding. Clicking on the feedback link next to the seller's name will take you to the seller's feedback page, which gives you more information on that seller's history. On the feedback page, you can see they have 3 negative feedbacks. How do I translate feedback? 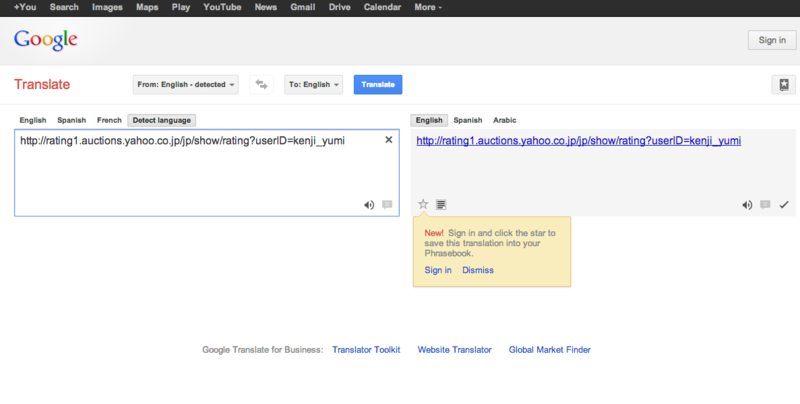 You can plug the sellers feedback page into google translate quite simply by copying the URL and pasting it in a google translate window. Avoid sellers with excessive negative feedback. 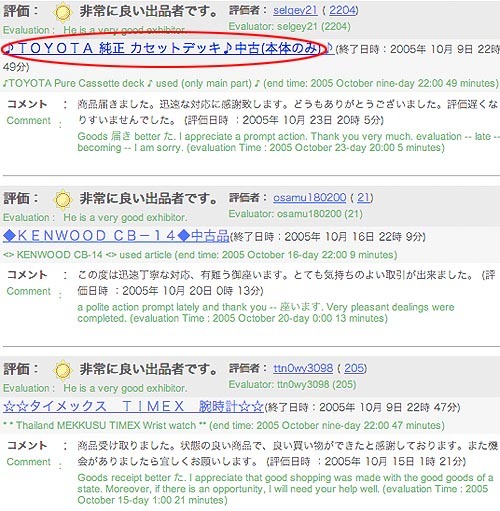 On Yahoo Japan Auctions, sellers routinely have less than .1% negative feedback, so 5% is a lot. In the feedback example above, three negatives may not seem like a lot, but this means negative feedback is over 5%. You should think twice before bidding on an auction with excessive negative feedbacks and start examining other parts of the feedback history so you can make a better judgment call. What is a system negative? For some reason the seller didn't sell to the buyer, and the auction was cancelled in order to give it to the next person in line. These can occur for legitimate reasons. These kind of negatives are removed in 6 months. 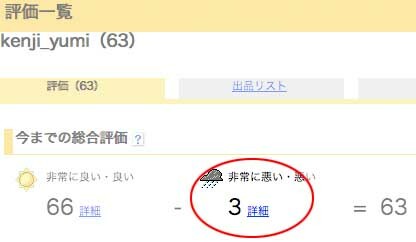 In the picture, we've circled the Japanese characters for "Automated message" for you; if you see these (or "Automated message" in the translation), it's a system negative. 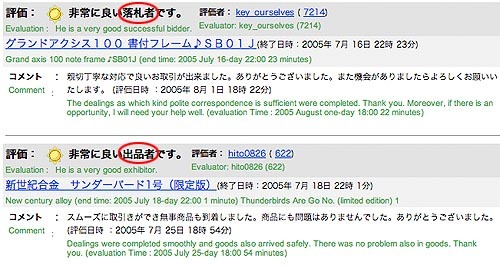 Be cautious with sellers with a high-priced item but with positive feedback only for buying on Japan Auctions. 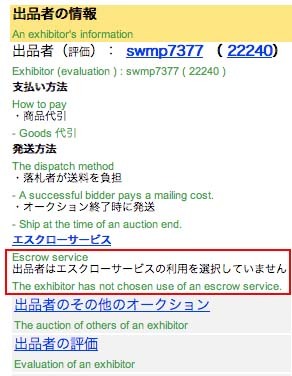 You can tell the difference between feedback for buying and feedback for selling if you translate the page, (The translation engine calls sellers "exhibitors.") We've also circled the relevant characters that mean "bidder" and "seller." Scan down the list; one seller with a feedback of over 100 had the first thirteen on the list as a seller, but then the feedback became mostly for buying. Such a record shows very limited selling experience. You may want to avoid bidding on the items of such sellers and see if another seller has a similar one, or you might want to check for more clues. Check the auction page to see if this person accepts COD or escrow payments. Also check the seller's introduction page. Sellers with low feedback can be shady; however, for the most part these some are just starting out and are perfectly legitimate. Look for more clues. Does this seller accept COD or escrow? Have the items they sold in the past been high-priced? Is the current item high-priced? Did you check the seller's introduction page? How do I look at what a seller has sold in the past? This information is found on the feedback page. Scan down to the comments section and click on the auction titles (we've circled the first one in the list for you) to see what the item was. 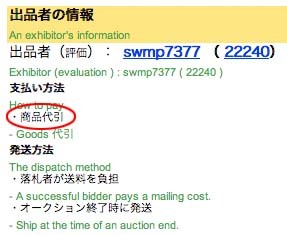 Also, by translating the page and scanning down the auction titles, you can usually get an idea of the seller's specialty. Even with only the three comments shown here, it's clear this seller generally handles electronics. How do I check the value of the items this person has sold in the past? Again, as with the general history immediately above, you start on the feedback page and click on the auction title. When you get to the auction page, look for the closing bid. The one shown here is, of course, very minimal. Be cautious with sellers who have sold few high-priced items. Sometimes we may find a seller who has only sold very low-end items in the past and then all of a sudden has this high-priced item. This doesn't necessarily mean that the seller isn't reliable, but you should certainly look for more clues. Again, check to see if COD and escrow are accepted , and look at the seller's introduction page. Be cautious with sellers auctioning a high-priced item of a different kind than usual. A seller of vitamin supplements suddenly has that Blythe doll you've always wanted for sale. This may just mean the seller is cleaning house; however, you certainly want to check for more clues. Does this person accept COD or escrow payments? Do they have a large number of positive feedbacks? Do their vitamin supplements garner high prices? Did you check the seller's introduction page? When on the seller's feedback page, click on the third tab. Translating is, of course, a good idea on the introduction page, too. Checking a seller's introduction page can sometimes give you clues. For example, if a seller had 5000 feedback but started over again with a new ID, you know you can safely bid on their new ID with no feedback. Things like this may be located in their introduction page. Does this seller have an on-line store? Check out their website and see if it gives you confidence to bid on their items despite what their feedback shows. How do I check if my seller accepts COD? In the seller's information on the auction page is a "How to buy" section. Unfortunately the translation engine doesn't do a very good job on it, but we've circled the characters so you can recognize them when you see them again. 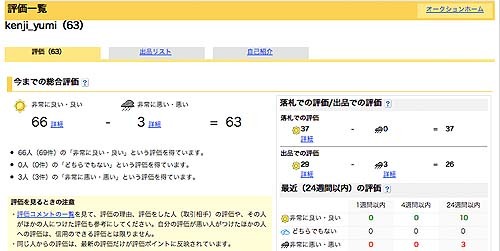 This is one of the few points where the ability to see Japanese characters is very helpful; fortunately, there is Japanese support available in most current operating systems. See your system's documentation for details on how to install Japanese language support. How do I check if my seller accepts escrow? This is on the auction page. First, translate the page. Then scan down in the furthest left column (seller information) for "Escrow service." The seller in this example does not accept escrow payments. These two forms of payment mean that the seller does not get paid until Rinkya receives the item. 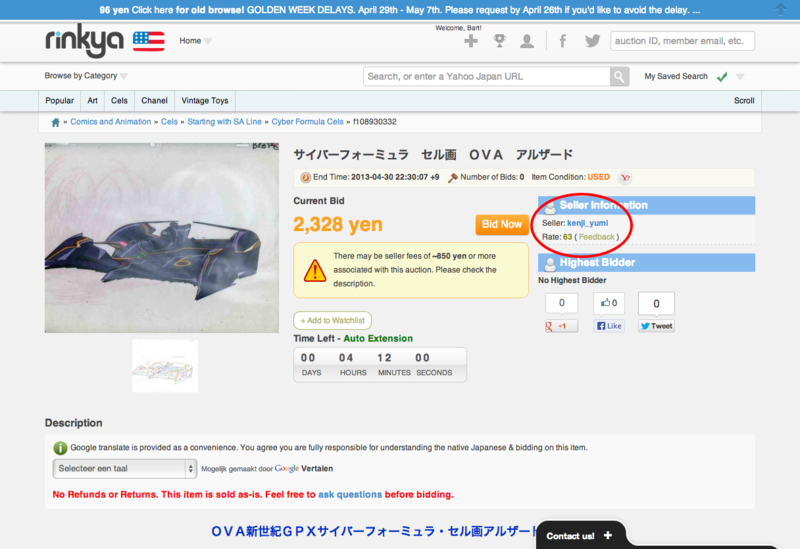 Yahoo Japan sellers accept all sorts of payments, and a seller who does not accept COD or escrow may just not want to deal with those types of payments. It does not mean their auctions are not safe to bid on! However, if your seller is questionable, their accepting COD or escrow can give you the peace of mind to bid. If they do, you know that they are legitimate. With these tips in mind, you should be able to find just the item you want, from a seller whose honesty you can trust. Good luck bidding! The information provided here is to help make more informative decisions when bidding and is not a substitution for a bidder's judgment. If you feel unsafe about a transaction, do not bid. Rinkya account holder's are responsible for all bidding to their accounts. Please review our TOS, refund policy and our Buyer Protection Plan for complete coverage of your responsibilities as a Rinkya accountholder. These documents are our store policy and are legally binding contracts between Rinkya and the user agreed to when a user signs up to Rinkya.